Celebrate Setsubun with demons, beans, and maiko! Wait! 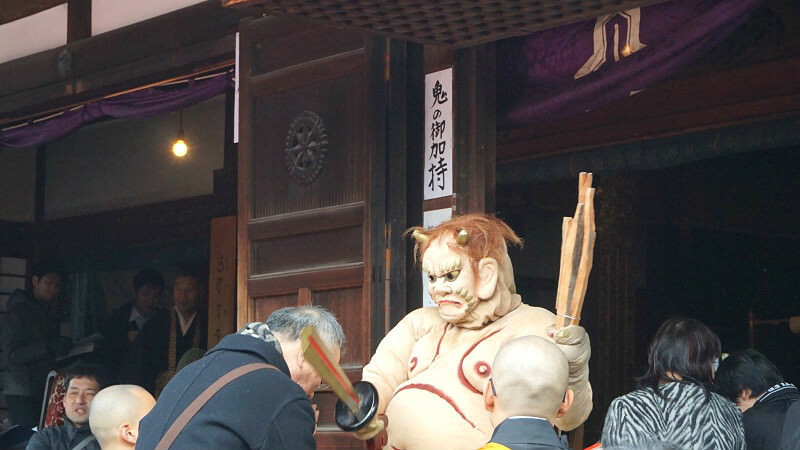 There is more to Setsubun in Kyoto! In part one we introduced the Setsubun festival at Yoshida Shrine, but there are other Setsubun festivals in Kyoto too. There are interesting Setsubun festivals held at many of Kyoto’s temples and shrines, on the day of Setsubun and a day before and after. 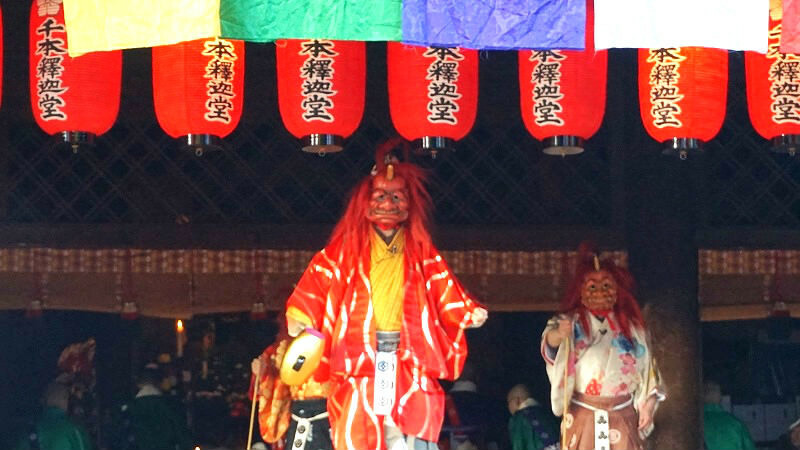 In part two we are going to introduce our three favorite Setsubun festivals! We already went to Yoshida Shrine’s Setsubun festival so this time we are going to join different celebrations. This part two is especially suited to those who can’t decide which festival to go to! Rozanji Temple is located east of the Kyoto Imperial Palace. 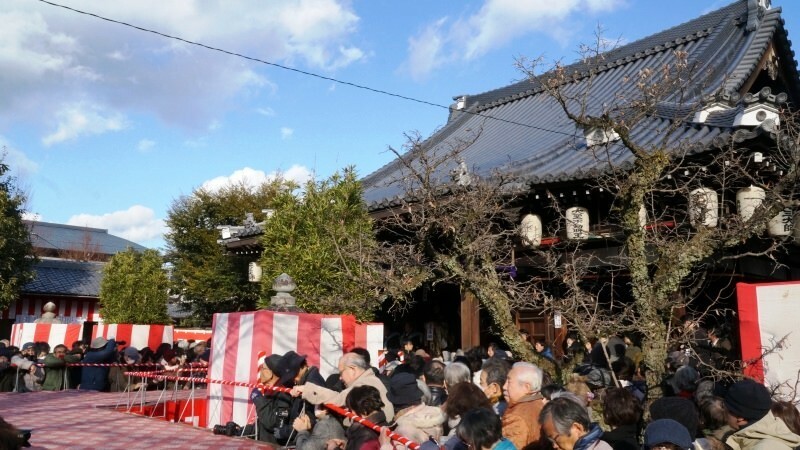 The Rozanji Temple Setsubun festival is a second only to that of Yoshida Shrine’s. Normally Rozanji Temple is quiet but on the day of the Setsubun the temple grounds are bustling with life. Most popular is the humorous dance of the torch-holding red, blue, and black demons. The demons dance their cumbersome dance to the sound of drums and trumpet shells. It is an interesting sight but most little children find the demons a bit scary. What marks Rozanji Temple’s celebrations different from all the others is not only their demon dance but also the demon healing ceremony. When you tell the white demon what part of your body needs healing, he will lay his sword on your shoulder and pray for you. This demon is white because it has been purified by an exorcist of its malevolence. 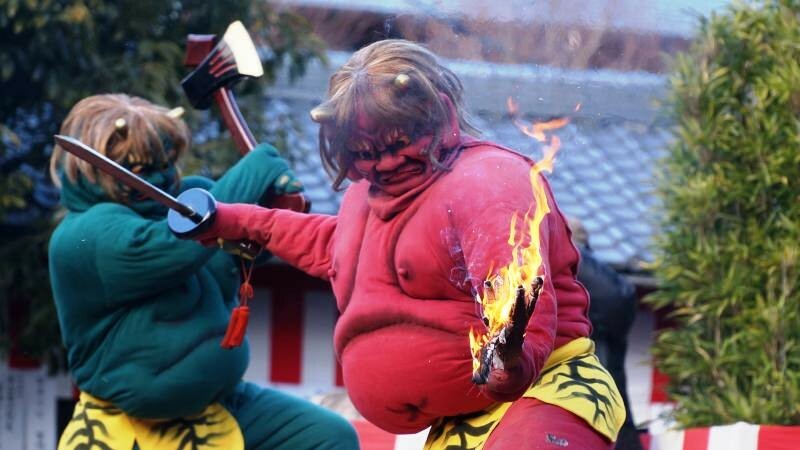 Every year really many people go see these demons at the Rozanji Setsubun festival. For those who really want to enjoy Kyoto’s Setsubun, we recommend you go to Rozanji Temple first in the afternoon and then at night go to Yoshida Shrine! 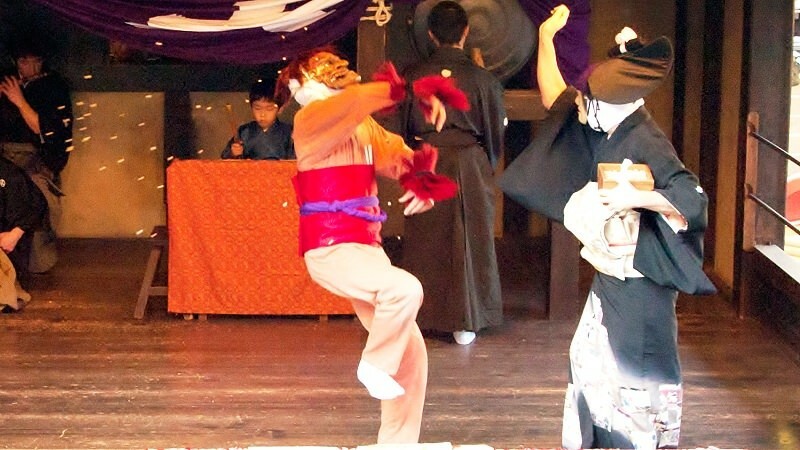 Mibudera Temple is famous for their pantomime Noh farces, and of course they have one on Setsubun too. They even have a special farce that is only acted on the day of the Setsubun. The farce is about driving off the symbol of sickness and poverty, a demon, by throwing beans at it. In addition to this Buddhist mountain ascetics perform a homa (burnt sacrifice) ritual. In this picture you can see the Mibudera Temple specialty, horaku earthenware plates. Horaku is a type of unglazed pottery. 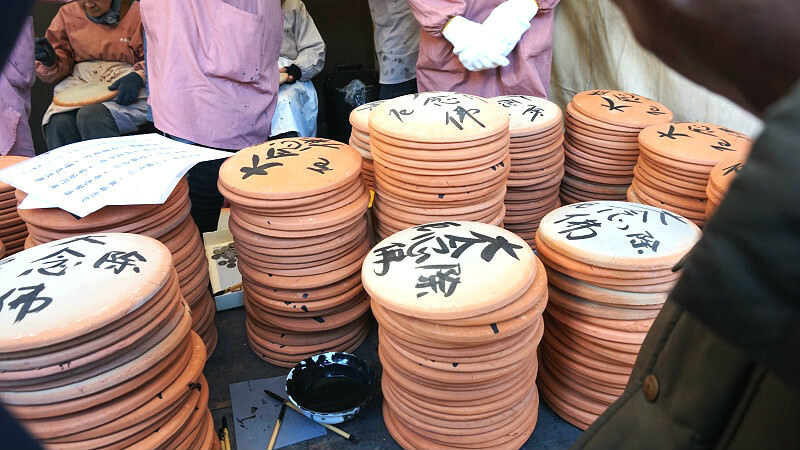 This horaku has the power to ward off evil so on the day of the Setsubun festival the parishioners write their names, their family members’ names, and their wishes on the plates. These plates will then be thrown off the stage and shattered during the first act of the Mibura farce. Evil is warded off by shattering the plates. On the day of the Setsubun the temple grounds come alive with stalls and tens of thousands of worshippers. We hope you will go see this exquisite play of Mibu Noh farce! Senbonshaka-do Temple is famous for their “okamesan” mask of a woman that in their Noh farce drives off a demon. Usually a demon is driven off by throwing beans at it, but in this farce the “okamesan” mask gently persuades the demon to go away. So in this unusual story the “turtle” mask does not drive off the demon but makes the demon repent his ways. The “okamesan” mask with its adorable expression talks to the mischievous demons and makes them repent. She strokes their heads like a mother calming her child. Before the farce there is a dance performance by the maiko from the Kamishichiken geisha district that is a must-see. In the end everyone, including the repenting demons, will throw beans! There is a lot to this Setsubun event. 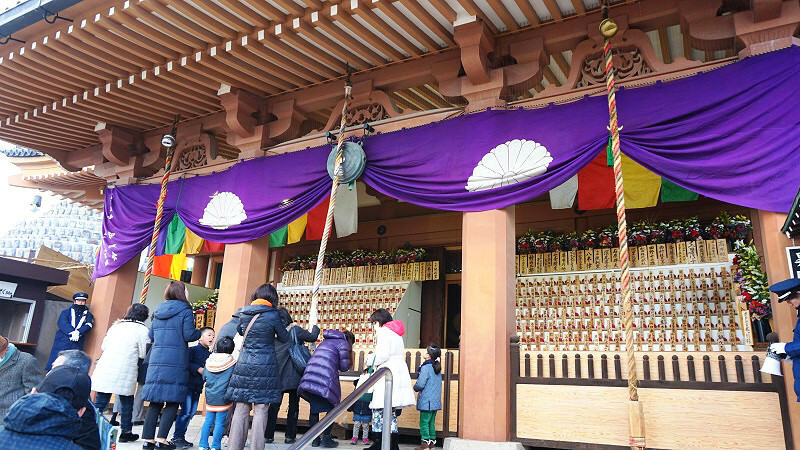 Senbonshaka-do Temple is close to Kitano Tenmangu Shrine and they both have the Setsubun events on the same day so how about participating in both! 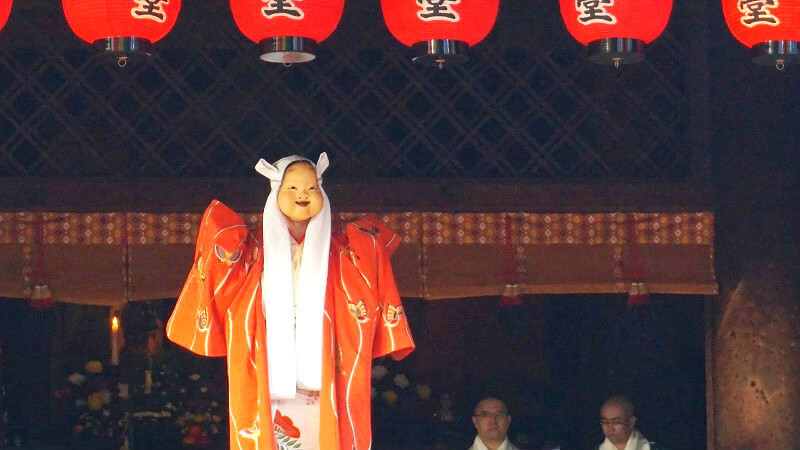 So, we just introduced the three best Setsubun events in Kyoto. These are all really popular events and many locals take part in them. Whichever you choose, I am sure you will have a real Kyoto Setsubun experience. 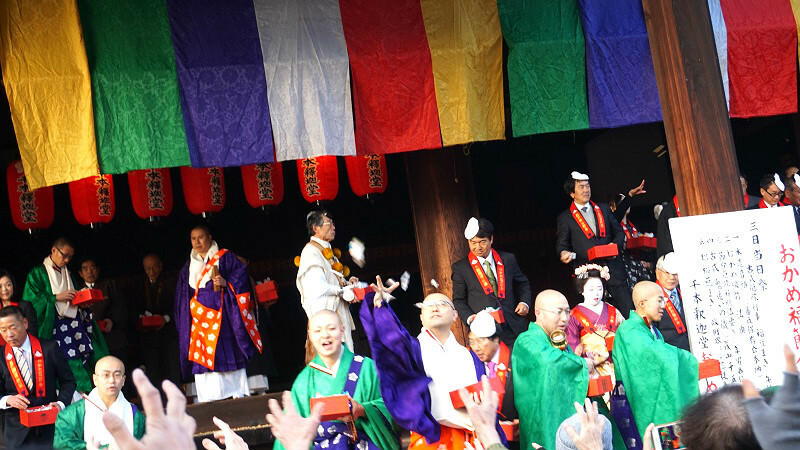 If you are in Kyoto during Setsubun, we hope you take part in a Setsubun festival! Part 1Kyoto’s BIG Setsubun Festival! 4 Tips on How to Enjoy Yoshida Shrine’s Festival! Part 2Wait! There is more to Setsubun in Kyoto! Part 3Let’s Get to Know Setsubun Traditions! Part 4Let’s eat ehomaki sushi rolls!